11/20/2012: I've updated the template to include pin names and all nets, and am also now providing the original PCB123 design file so others can do the same. I've also moved the files over to GitHub so others can fork and contribute to improvements/updates. 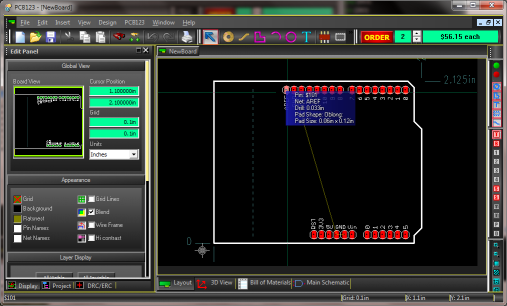 PCB123 is a PCB design tool (schematic, layout and BOM) that is made by Sunstone Circuits and made freely available. The catch being that boards designed in the tool must be ordered from them. That isn't a great problem in my opinion since Sunstone is a quality firm and has some affordable options (they specialize in quick-turn, which is more expensive by nature). There used to be a template in PCB123 for Arduino Shields. Since that's been removed (not sure why) I re-created one starting from Garret's EAGLE template posted on Macetech. To make the template in PCB123 I first exported gerber files from EAGLE. PCB123 can import gerbers, and that was the next step. Upon import the data was al there but the pad were done as polygons, which aren't super user-friendly and lack drill holes, so I took the time to convert them into real oblong pads. Here is the download link for the template: Arduino_Sheild_Scaffold.zip (now on GitHub). Drop the XML file inside the zip into your \ProgramData\PCB123\BoardTemplates folder (on Windows 7 and 8, or wherever on XP) and then use the Open Template command on the File menu to start a new board. It should provide a good starting point. If you find problems with it, or have suggestions on how to improve it, please drop me a note. Enjoy!